The Indian head penny was created to replace the Flying Eagle cent because the United States Mint was having problems striking the Flying Eagle cent uniformly. Under direction from Mint Director James Ross Snowden, James B. Longacre designed the replacement. The reverse design stayed the relatively the same while Longacre replaced the obverse design with an allegorical figure of Lady Liberty wearing an Indian headdress. Longacre first used this allegorical figure idea on the 1854 one dollar gold piece. The reverse design was very similar to the preceding Flying Eagle reverse. In the first year (1859) the reverse had a laurel wreath surrounding the words ONE CENT. In 1860, Longacre changed the wreath on the reverse side to a wreath made of oak leaves with the Union Shield at the top of the wreath. Due to the rising cost of raw materials during the Civil War, the composition was changed midway through 1864 from a mixture of copper and nickel to a bronze alloy. Additionally, Congress approved a reduction in the weight from 4.67 grams to 3.11 grams. Production of these cents continued through 1909 when the Treasury Department replaced it with the Lincoln cent that commemorated the 100th anniversary of his birth. Indian Head penny values and prices have remained historically flat when corrected for inflation. However, there are a few Indian Head Penny key dates and varieties that appreciate at a faster rate. Notes Difficulties in properly striking the copper-nickel composition led to the decision to change the composition to bronze in the middle of 1864. 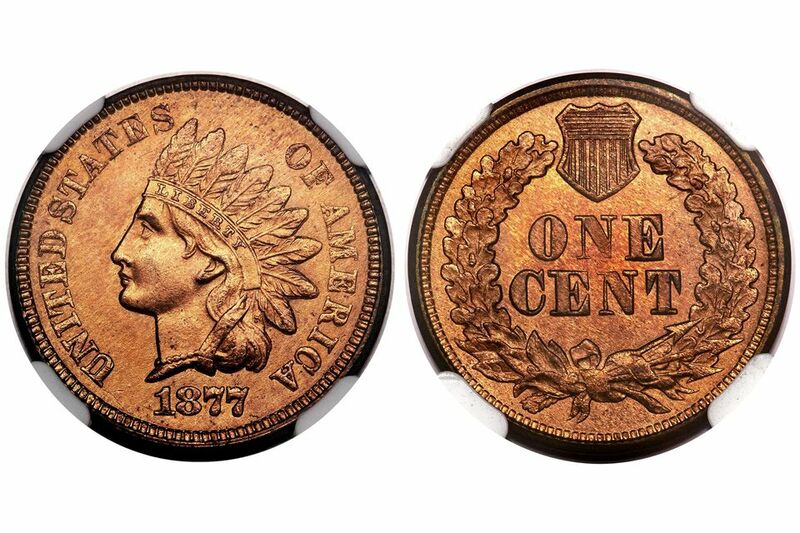 The Indian Head penny was minted from 1859 until 1909 and in two different mint facilities: Philadelphia, and Denver. Learn about the years, strike type, mint facilities, the mint mark used on the coin and a description of any type differences in coins minted for that year. Indian Head Penny mintage and production figures are reflective of the time in which they were made. there are several popular errors and varieties that Indian Head penny collectors look for because they carry a premium value over common date coins. 1869 Philadelphia 9 over 9 The doubling is most noticeable on the last two digits of the date, "69"
1869 Proof Philadelphia 9 over 9 The doubling is most noticeable on the last two digits of the date, "69"
1888 Philadelphia 8 over 7 The lower part of the last in the date (the "7") can still be seen sticking out from the lower left corner of the "8". 1888 Proof Philadelphia 8 over 7 The lower part of the last in the date (the "7") can still be seen sticking out from the lower left corner of the "8". How Much Is Your Three Cent Nickel "Trime" Worth?